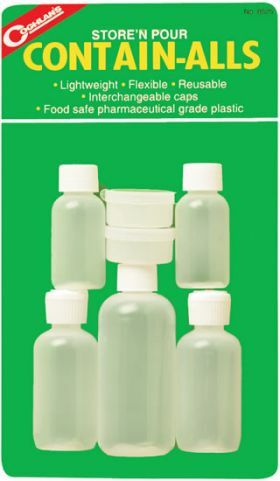 Food safe plastic containers with interchangeable caps for every pourable liquid or solid such as instant coffee, sugar, cooking oil, lotions, pills, ointments, etc. Lightweight, flexible, and reusable. Storable Containers can keep all your favorites separated and safe! 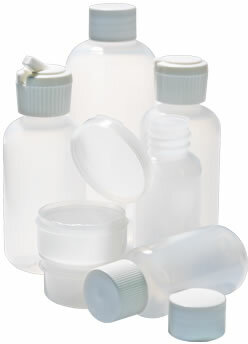 These storable containers are just what you need to make your kit even better. You get 7 separate containers in all. With these food safe pharmaceutical grade plastic contianers, you can take along some really good things for your kit. Keep a bottle full of olive oil for your knives to keep them oiled up. Olive oil won't go bad and protects from rust. If you're on a few days outing, you know you'll want some coffee. These small containers provide just the right amount. Cream and sugar? No problem.